You don't need to know how to sail to buy a sailboat! I didn't. I had floundered around on a $50 windsurfer that I had picked up at a yard sail so I kinda sorta understood the sailing concepts... maybe. After my Mom had died (my Dad had died 7 years earlier) I got to reminiscing about my childhood. We always had a boat of some kind. We progressed from a little wooden fishing boat to an open bow tri-hull boat that my two brothers and I could ski from. (We're all big guys) I think it was 15 ft, I thought it was HUGE. My brother Wayne has the old boat now (similar to the boat in thispicture) and it seems to have shrunk. I had many fond memories of the lake and wanted to pass this on to my kids. I decided that I wanted to buy a boat for my family. I had about $5,000 to spend and I thought that any motor boat that I could buy for that amount would most likely be a piece of crap that I would have to constantly fix to keep running. 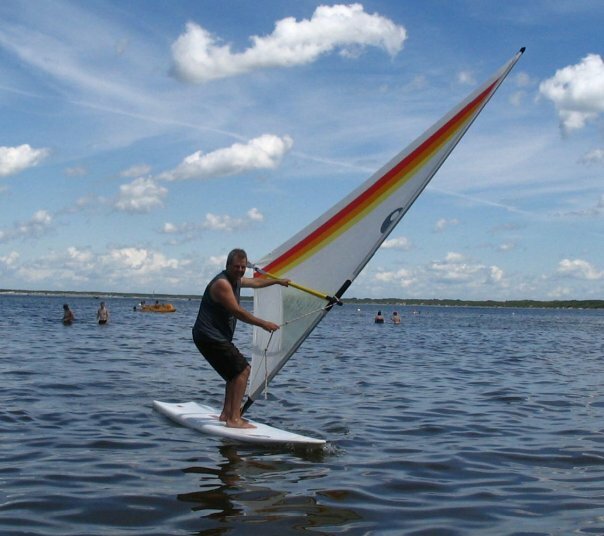 I thought that I would try to buy a Hobie-cat and learn how to sail. A friend of mine, Michael, was commodore of a nearby yacht club and convinced me to join. There was a Flying Scot and a Fireball that club members could use. As Michael put it "Hobie cats are fast and fun but you're going to get your arse wet, they're warm weather sailing"
Before I even made it to the club my first sailboat came up for sale. It was a 1977 Sirius 21. It was a 21 ft long, swing keel, sleeps 5, porta potty, sink, outboard on a trailer ready to go for $4,000. I dragged this baby home with my minivan and then on to the yacht club. Club members there helped me step the mast and get it into the water and showed me how to tie spring lines to the dock at my new slip. The first 5 times out of the marina I never even put my sails up. Using the outboard we would go for little trips and maybe a swim. Then one day my friend Brian from the club came with me to put up the sails and actually sail. I was hooked. From then on I would pick days with just the right amount of wind to go out and practice. I sailed and I sailed and I sailed. My perfect days got windier and more varied. I read Sailing for Dummies and any book that I could get my hands on. The more I sailed the better I got. Anyone can do the same!